By Newcastle standards, March proved a relatively quiet month. Obviously, there were lows in the form of a charge of misconduct and yet another brush with the law for one of our players, but the real positives to take from the month were new contracts for three of our key performers this season and seven points from a possible twelve, with wins against Norwich and West Brom contrasting with a sickening last-gasp defeat to Arsenal and a satisfying point against 5under1and thanks to Big Lad’s ongoing personal crusade to vanquish the forces of darkness at every chance he gets. The Lone Ranger enjoyed a particularly eventful month, one minute talking positively about turning his life around, and the next breaching bail, appearing before a judge and getting into trouble for his use of Twitter. On the player front, in addition to new contracts for Tim Krul, Sideshow Bob and Raylor, came the news that unsung hero Danny Guthrie will have to wait until the end of the season before finding out if he is also to be offered a new deal, and we kept an eye on the players in our squad currently plying their trade elsewhere - although, by the sound of some of the feedback, Alan Smith for one doesn’t appear to be excelling. By contrast, HBA now looks to be settling in nicely, with some pretty ambitious goals to aim for. One possible new addition to the squad who was mentioned is Jan Vertonghen of Ajax, although seeing as the world and his wife appear to be monitoring the player, the likelihood is he won’t end up on Tyneside. Financially, we published our accounts for last year and they were promptly given the Swiss Ramble treatment, with a largely positive report. 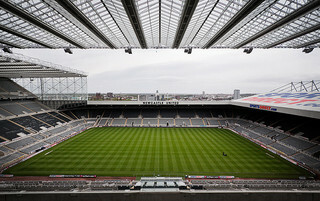 Derek Llambiarse was also quoted talking about finances, while the revelation that he and Jabba still refer to our home as St James’ Park appeared to somewhat undermine any quest to attract someone willing to pay for the rights to have their name attached to our ground. On the subject of finances, it was interesting to learn that we’re always seeking to make a quick buck and with club emporia now stocking some of Demba’s syrup and Newcastle shirts prominently on sale Stateside. Whilst Llambiarse might have been happy to talk about things, the Silver Fox was told that the question of the England manager was taboo and we entered the lexicon of footballing phraseology, with Man City reportedly on the verge of "doing a Newcastle". Ben took the chance to moonlight, giving his thoughts on partisanship and the relegation prospects of those teams down the bottom of the league a good airing over on The Two Unfortunates, and one of our old boys did his bit for the relegation scrap, and our own race to Europe by gift-wrapping three points for QPR against his new employers Liverpool. All in all, a quiet one really.